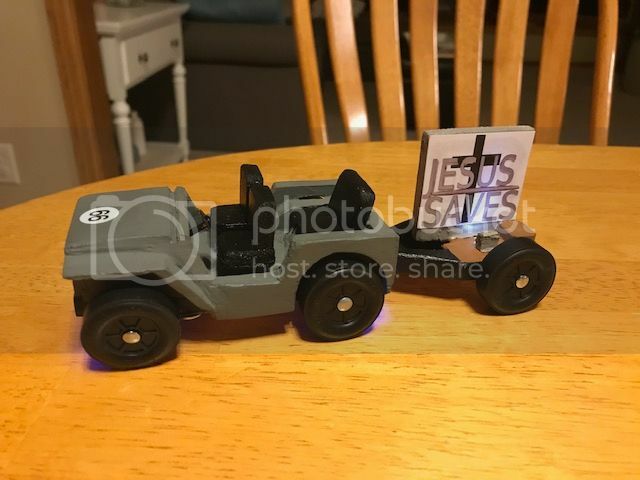 We had our 2nd Annual pinewood derby event at church today. I put on 2 workshops and offered a Builder Class where the cars are built entirely at church with church supplied materials. These cars stay at church until the race. We also had Open Class where cars could be built with any materials anywhere but had to adhere to NSC rules. That's pretty cool! 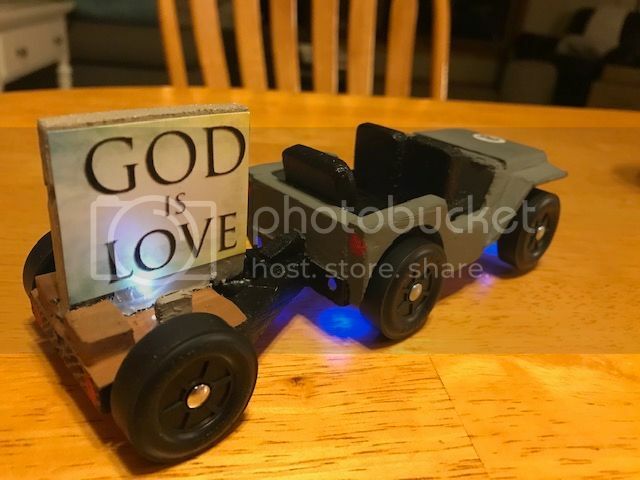 It looks like the "trailer" is rigidly attached to the "jeep", making it a 6-wheel derby car rather than a 4-wheel derby car with a trailer. Is that correct? 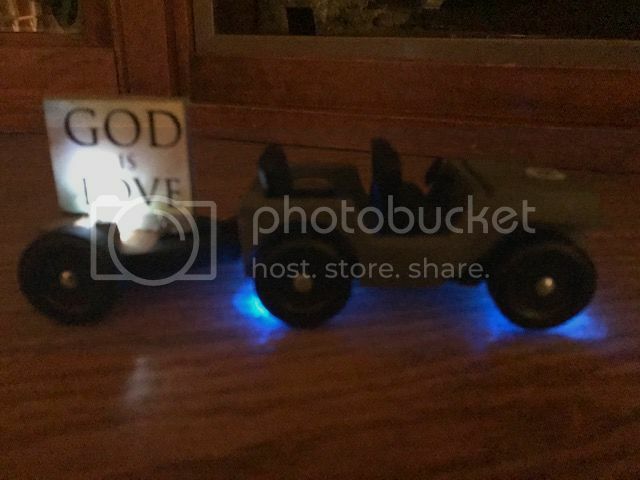 Way to go with the light's on this Jeep with a trailer build! Last edited by whodathunkit on Sun Oct 21, 2018 12:17 pm, edited 1 time in total. The Jeep frame and trailer are all one piece. 1/4” thick hollowed out block. Thanks. Not anywhere’s close to your works of art. I think I need more tools. Yeah, yeah more tools would be good. Are you kidding me davet .. Your 's is the work of art here! 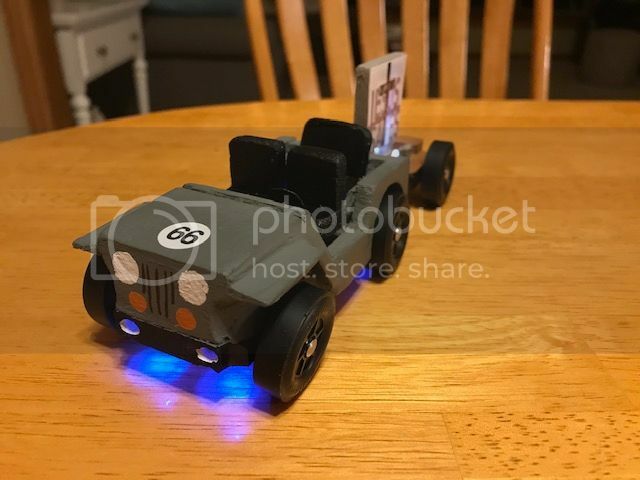 And as much as I hate to say it , I have yet to build a derby car with working lights that lasted. However I have tried to do one of my guitar design's some time back by using the working's out of a musical hallmark card with fiber optics lights. To play music and light up the strings.. it worked and looked cool in the dark .. However the music and lights did not play for very long while working . Looks great. 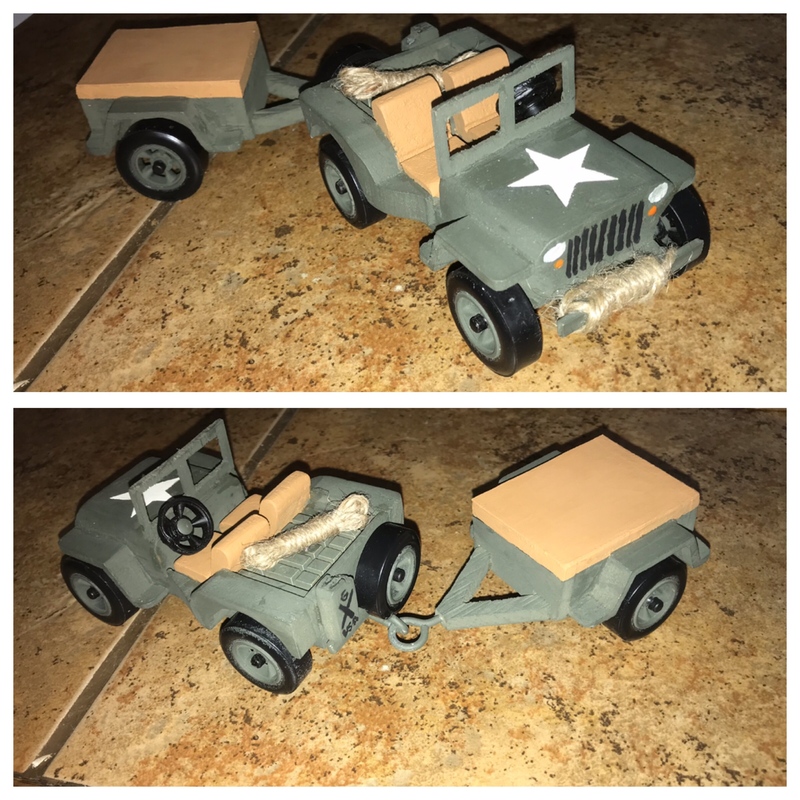 I built a army Jeep with trailer for this years outlaw. I build one each year just to show out for the boys. I like your use of lights. Thanks Zebracar. Any pics of your rig! I found a cut sheet on line. I printed it off and sized it to scale with a copy machine. Then it was just a lot of scrollsaw work and glueing peices together. I free handed the fuel can on the back bumper and I free handed the trailer just from my head. I also cut the tire off of one of my wheels and used it for a steering wheel. Oh man! Beautiful. Mine looks good from 10’ away. Yours is really a work of art. A scroll saw sure would’ve cut my time down vs my knife and sandpaper method. I couldn't have done it without the tools, time, and this pdf file. I did spend a lot of time on the details. It's fun o show off for the boys. Funny you should say that davet! if you carved your jeep out with a knife you done a really good job of it! And nice use of the Max V wheels as well on the jeep! Zebracar.. very nice job with your jeep build as well.. I like the way the jeep looks with the PineCar brand mag wheels as well ! Speaking of the Fox chapel Pfd file you used.. and devet wishing he a scroll saw to use. From the pattern in the scroll saw mag... the jeep i had made had no trailer behind it! just a canvas looking top that I made for it. Pic of the jeep with out a trailer or working lights. Last edited by whodathunkit on Sun Feb 03, 2019 7:50 am, edited 2 times in total.